Tuesday August 6th 1901 I was busy about the cooking all forenoon. We had men for dinner as they are stacking oats. I went down town in the afternoon. I found Father not very well I met Hatt & Dorothy at the depot at four oclock they had been out to West Branch to spend the day. 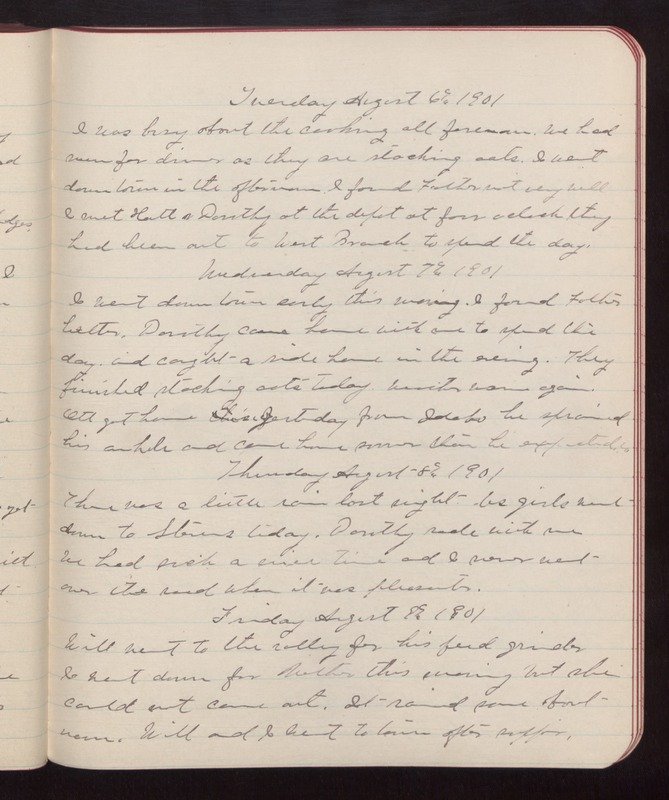 Wednesday August 7th 1901 I went down town early this morning. I found Father better. Dorothy came home with me to spend the day, and caught a ride home in the evening. They finished stacking oats today. Weather warm again. Ott got home yesterday from Idaho he sprained his ankle and came home sooner than he expected. Thursday August 8th 1901 There was a little rain last night. Us girls went down to Stevens today. Dorothy rode with me We had such a nice time and I never went over the road when it was pleasanter. Friday August 9th 1901 Will went to the valley for his feed grinder I went down for Mother this morning but she could not come out. It rained some about noon. Will and I went to town after supper.